Sean Banks wrote: 3 years? I was thinking 1 year at the most if I did it myself.........mind you this would be something I would be working on everyday. On another note do you know of any books or videos that describe in detail how to build one of these cob house?....my biggest obstacles I think will be the foundation, doors, windows, and the roof. Just a little insight on the design....a green roof with native plants and outdoor cob oven with benches (might make this a summer kitchen). Water will be coming from a well and the greywater will flow into a constructed wetland. Power will come mainly from solar panels and a small wind turbine...might also include hydro system. A composting outhouse will be onsite to take care of waste and a rocket stove will be built inside the house. Away from the house I want to build a earth sheltered passive solar greenhouse and plant a large garden with a food forest. My plan is to build the house first then take care of the greenhouse and garden later. Definitely "The Hand-sculpted house" is my favorite comprehensive book on the subject. Although, I am still looking for more information on round-pole timber supports for the roof. His time line is much shorter for a small cottage. Travis Johnson wrote: Honestly, that is an excuse any Code Enforcement Officer has heard before and it is not going to work, that is why thy have after-the-fact-permits that cost 3 times as much. 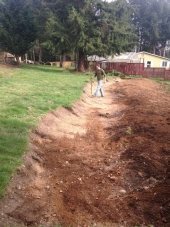 You want to get the permit, then get the mini-excavator and save yourself more grief then the weight of soil you are removing. You might wonder about it now, but you won't when you are using a pick and shovel and hit a wheelbarrow sized rock just under the soil. Mini-excavators are light and ride on tracks. I have a bulldozer and its weight per square inch is less than a person. In other words a person walking on the ground compacts the soil about twice as much as my bulldozer. The amount of work accomplished even by a small excavator is amazing. You won't regret getting it, nor the piece of mind of sending in for your building permit. There is an age old story; "you can't fight city hall". I'm on the way to write a book with lot of pictures and detailed plans about that project. I definitly want to produce that book in german, english and russian language. May be I get it done the coming winter. Galen Johnson wrote: Let's face it, a lot of people just don't want to do a I-Love-Lucy grape stomp on their cobb. There is enough work in house building as it is. I've seen various hand operated concrete mixers at good prices, and they do cut the work by at least a half, from all reports. They look like good deals for the cobb housebuilder. But you can only get them in India or China or South Africa. They don't make them in the U.S. or at least, they don't sell them here. 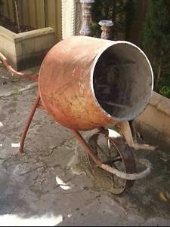 Has someone out there adapted a 55-gallon drum, or a salvaged concrete mixer, to operate manually? Or even better, hooked up a bicycle to one, so that a peddler can turn the thing? Is there no better way to make cobb but the Israelite-slaveing-for-Pharoah way? I don't know if you're still wondering as this is an old post. I was thinking it might be pretty simple and easy to hook up a bicycle powered cob mixer. Do the gear work and belt-system that you might find on a peddle powered clothes washer. Hook it up somehow to a drum on stationary rollers? just brainstorming as I'm trying to come up with something similar. Check this cob house inside a green house in the arctic circle ! Troy Rhodes wrote: I built a hoop house, and on the money I saved on the labor, I splurged on the materials. I put a bent steel conduit rib every two feet. We get very heavy snow loads and zero problems. This is my 3rd winter. I have seen many of the inexpensive kit greenhouses and quickie garage substitutes squashed in the snow, or damaged by the wind. They use the 4' spacing, but evidently, not heavy enough. Where do you recommend ordering from? I'm looking for a small but very sturdy hoop house to put up myself this year. Are you doing something that requires a permit without getting one? Would you rather the same stickler made you demolish the structure later? Good question, and a fair point. I actually have this structure designed into my master plan as an 'accessory structure'. Mostly because I don't want to adhere to a minimum sq ft requirement for occupational permits, and such. Everything about it is permitable under my local township ordinances and state building laws as a non-occupy-able accessory building, (as the roof will be supported with structural timber framing, the motored stone stemwall, etc. all are allowed). The most they could do at that point is give me a fine for building without a permit, and force me to go send in my application for a temporary use structure, building permit, etc. (which needs to be renewed every 6 months). I do have all of the paperwork necessary, mostly filled out and ready to go. In case someone shows up demanding to see permits, a "whoops, i forgot to send this in" might save the day. It seems to be a waste of resources that I'd rather avoid altogether if I can. I do have a larger structure planned into the design that would meet all standards imposed for a dwelling that I would use more as an education & resource center. The footprint of which will be my annual garden for as long as it takes me to afford such a building. I'm building a tinyish (18'x18' exterior wall, with 2' thick walls at the base) cob house this year on a rural 1 acre plot that we're acquiring by land contract. I don't want to attract too much attention from anyone (except my only two neighbors that are both cool). The foot print is guna be about 28'X28' on account of the "curtain drain" to be dug around the drip edge of the 26'X26' roof. I'm wondering what peoples thoughts/feelings are on excavating by hand or by machine. Ianto Evans swears by hand-dig, as it's more sensitive to the site environment and is less conspicuous. It would definitely take more time, but cost much less money, and I'm all about trading my time for money in most equations.